I am a serial offender in the hair dye department, any colour you can name my hair has been, from the natural blonde I was as a kid right through to a deep black, and every shade of the rainbow you can dream of. 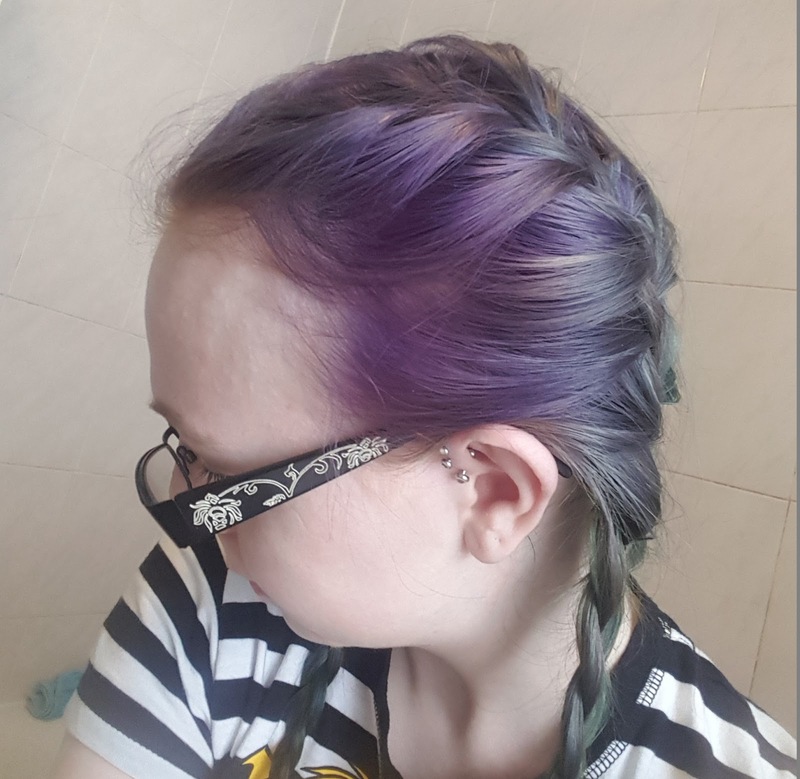 I now work in a job where my hair needs to be more natural and normal, and I fully appreciate that, I thought my cravings for the bright hair had long passed since leaving uni and going into a job. Oh they had not. I am lucky in the fact I have a few weeks off over the summer and I decided I would go all out with my hair and just go crazy! 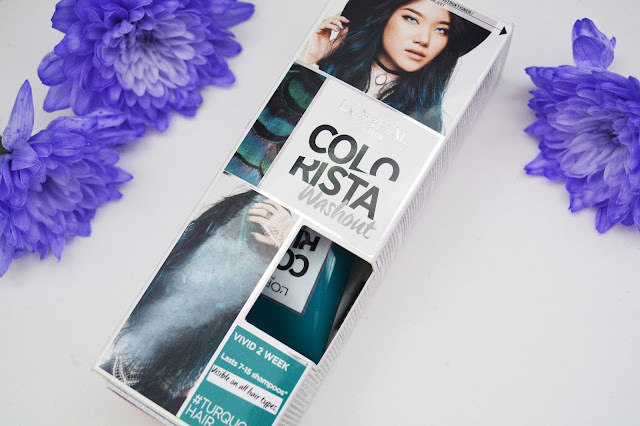 So when I saw the Colourista dyes on offer I decided I had nothing to loose if I tried them and gave them a go! lets see how I got on. First up I should probably say, a video has gone up on my channel here if you want a little bit more info on the process and to see my talking through what we do. However I wanted to share a bit more on how the colours lasted and what I think to them overall. I tested out two of the colourista dyes, although I did buy four I think I will wait until I have washed some of this out to go for different colours, or maybe around Christmas do some colour then! Lets talk Turquoise dye first. I picked this up as its something different to the usual colours I reach for now, so I thought I would pick it up and see how it looked and how I got on with it. I decided to do the underneath of my hair with the turquoise colour to give it dimension and a bit of difference, and then use the blue on top for a mermaid style look. The turquoise colour took really well on the hair and looked lovely even though my hair was a light to mid brown, and I was so pleased with the colour it went. I wish I had done this all over my hair as I love the colour it went, but I do like this and I found the colour didn't seem to rinse out of my hair when I washed the colour off, and so it was quite clear from the start. I really like that as I hate it when you get lots of colour rinsing out of the hair every time you wash it and then it gets all over the towels again and it can be such a pain so this was a better option than some others I have used in the past. The indigo hair dye is slightly less amazing, I think this one was needing to be put on lighter hair than mine was, it took to my blonder roots amazingly, but came out more purple than the indigo blue the tube showed, so had I wanted blue hair in particular I would have been disappointed, but I am glad this is a purple blue as the blues I have used in the past have gone green when fading so if you want a more purple tone, get this one. Saying that I feel like it didn't cover on my light brown hair at all that well and went more of a black and really dark shade which caught the light a more blue tone but I don't think it looked as nice as it could have done.I love the way my root section looked as that did go really purple, but on anything that isn't blonde you wont get good results from this. Overall I feel mixed about these, the green took amazingly, and the blue would have done had my hair been the blonde it needed to be, however, the blue did go purple which for some people wouldn't be what they hoped when it looks so blue on the box. The lasting power of these is good, I have used just shampoo on my hair while the colour has been on and after three washes I saw minimal fading and minimal colour loss, but I did decided I would top up the colour on wash four, just to give it a boost as I can only keep it like this until September, so I thought I might as well top it up. I have also used dry shampoo to prolong my hair between washes, especially when I have been to the gym and it isn't dirty but I can get away with a bit of dry shampoo and a body shower, like on weights days where I have sweated less than if I do heavy cardio. I think for £6.99 on Boots here they are really good for the money and a great way to have a fun colour in your hair!